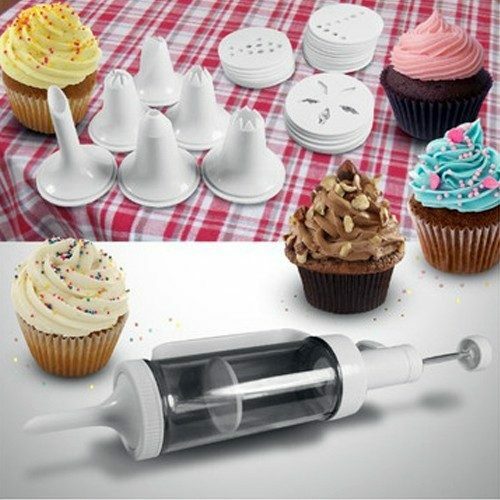 31pc Cake Decorating Kit With 6 Decorating Icing Nozzles Just $5.10! Down From $19.99! Ships FREE! You are here: Home / Great Deals / 31pc Cake Decorating Kit With 6 Decorating Icing Nozzles Just $5.10! Down From $19.99! Ships FREE! GearXS has this 31-piece Cake Decorating Kit with 6 Decorating Icing Nozzles on sale for $5.10 (Reg. $19.99) when you use promo code GXS-PRES + FREE shipping! Decorate a cake quickly and make it an artful masterpiece — and have fun at the same time. The pull-out syringe pushes filling smoothly through the cylinder and onto the cake. No mess – perfect lines and decorative designs. The kit comes with 6 different topping idea tips. It’s dishwasher safe. It measures 12 7/8″ inches with the syringe fully extended and the cylinder is 5 7/8″ around. Order your kit today.